USA Judo‟s Marti Malloy, -57 kg (USA Judo Training Site, San Jose State University Judo/NYAC, San Jose, CA) is standing on top of the world – the World Championships in Rio de Janeiro, where she won a silver medal today, added to the bronze medal she won at the Olympic Games in London last summer to solidify her status as a superstar in this sport. 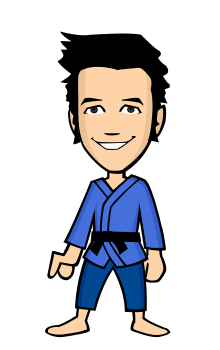 Malloy hails from the USA Judo‟s National Training Site at the San Jose State University Judo Club in San Jose. She went 5-1 at the World Championships today in her 57 kg. division, putting her in a very exclusive club of just 28 U.S. athletes who have medaled at this super elite tournament, second only to the Olympic Games in terms of prestige and international ranking points. Only four Americans have taken gold and now eight have won silver at the Worlds. 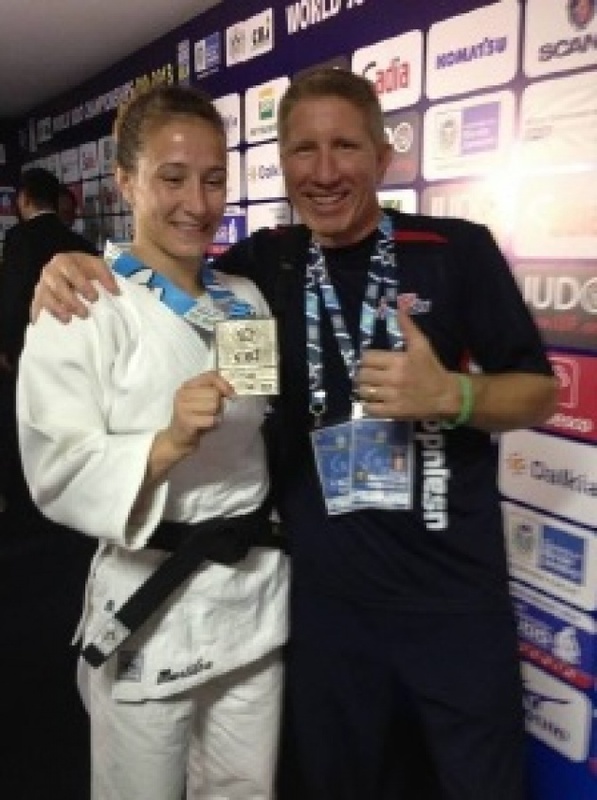 One of those four U.S. athletes taking gold at the Worlds was her coach today alongside the mat, who also hails from San Jose State University Judo, Mike Swain, a USA Judo board member. This victory puts another tremendous victory around her neck in a very short period of time. She has been on a vertical tear through the international circuit, taking not only the bronze at the Olympic Games in London and the silver at the World Championships today but also a gold medal at the Grand Prix Miami in June, another elite international tournament.
" Marti's determination to win is so inspiring,” said USA Judo President Lance Nading. “The improvements she continues to make every day are bringing her closer and closer to that Olympic Gold Medal she so deserves to win in 2016. It's going to be a great ride to watch for all of us." "How exciting for Marti and the entire USA Judo family to fight for gold in Rio. Today was Silver but in 2016 it will be gold for Marti,” said USA Judo‟s CEO Jose H. Rodriguez. “My congratulations to Marti and Mike Swain and his coaching staff at San Jose. They had Marti prepared and ready for this." On her climb today, Malloy took down the No. 3 ranked fighter in the world in her division, Miryam Roper of Germany, and the No. 8 ranked judoka at under 57 kg., Ketleyn Quadros of Brazil on her home turf before a wildly cheering crowd of thousands. Malloy started the day with an arm bar for ippon against Anriquelis Barrios of Venezuela. She then picked up a yuko with a counter to win against Serbia's Jovana Rogic. Then she bested Brazil's Ketleyn Quadros, ranked 8th in the world, with a tai otoshi for yuko. In her fourth win, she threw Germany's Roper, ranked No. 3 in the world with Sumi gaeshi for ippon. In the semi-finals, she threw Vlora Bedeti of Slovenia with Sode Tsuri Komi Goshi for a wazari (half the value of the „knock-out‟ full point that ends a match) and a foot sweep for a minor point called a yuko. In the Final for gold, Malloy was again fighting a Brazilian in front of the home crowd, Rafaela Silva, ranked No. 4 in the world. Silva countered Malloy when she came in for a throw and scored an ippon for the win and gold. Rio De Janeiro, Brazil - Hannah Martin (25) made her debut at the 2013 World Championships in Rio De Janeiro today in 63kg placing ninth. Martin, from the NYAC, beautifully executed an armbar at the one minute mark in her opening bout to secure her first win against Helene Wezeu-Dombeu from Cameroon. Martin then moved on to fight against Brigitte Carabali from Colombia throwing her in the first minute with osoto for waza-ari (half point) and then finishing the Colombian off with a pin for Ippon (Full point). In her third match (round of 16) Martin had an epic battle against 2011 & 2007 World Champion, 2005 World Silver Medalist and 2012 Olympic Bronze Medalist Gevrise Emane from France. The match was a back and forth affair with the score being tied with a minute remaining. Martin appeared stronger of the two but questionably picked up her third shido (penalty) losing 3-2. Emane moved on to eventually win a bronze medal. Martin earned 108 points on the World Ranking list for making it into the round of 16. This result catapulted her from #18 to a career high #13 with 656 points. Left to right: Nick Kossor, Brad Bolen, Hannah Martin and Coach Jason Morris. World Team championships, as she will join US members, Angelica Delgado, 2013 World Silver Medalist, Marti Malloy (NYAC), Katie Sell and Sam Blier on Sunday September 1st. "I am extremely proud of all the NYAC athletes that competed in Rio as they all represented Team USA very well." said Coach Jason Morris " They further proved that they belong on this stage and have promising road ahead which hopefully leads right back to Rio for the 2016 Olympic Games." The stars were shining at USA Judo‟s Night of Champions as many of the best from the sport stepped out in semi-formal attire to honor two of the finest coaches in the country, Willy Cahill and Yoshihiro “Yosh” Uchida, with Lifetime Achievement Awards. 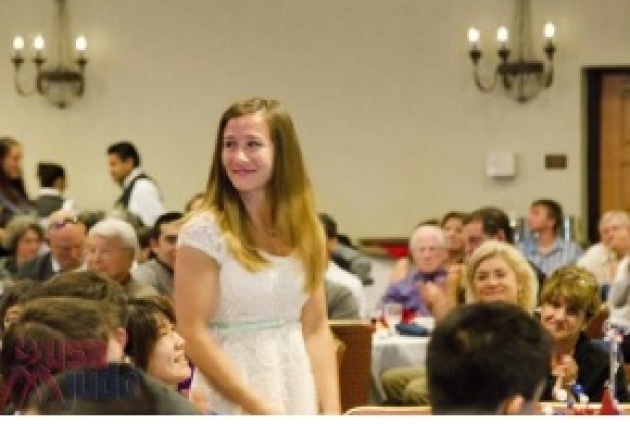 Joining them in the limelight was U.S. Olympic Bronze Medalist Marti Malloy, recognized for her outstanding achievement as an athlete with USA Judo‟s Champion Award. Serving as the keynote speaker was fellow judo star, World Champion and Olympic Bronze Medalist, Mike Swain, who serves on USA Judo‟s board and coaches alongside Uchida at San Jose State University Judo. Uchida is the founder of the San Jose State University Judo Club, which has produced so many elite athletes and Olympians, including Marti Malloy. A surprise arrived at the Night of Champions when Uchida was also awarded the highest rank in judo, a 10th degree black belt. Elections are being held this week at the World Championships in Rio for five positions on the prestigious Athlete‟s Commission of the International Judo Federation. They will be joining Kayla Harrison and three other superstars of the sport already named to the four-year terms. Harrison was among four of the world‟s finest, most accomplished judoka already named to the commission by IJF President Marius Vizer. Harrison joins the commission alongside Alina Dumitru of Romania, Teddy Riner of France and Kim Jae-Bum of Korea. Five other members of the commission will be elected this week by their fellow judoka at the World Championships in Rio. Election results will be announced on the last individual competition day of the Rio World Championships. 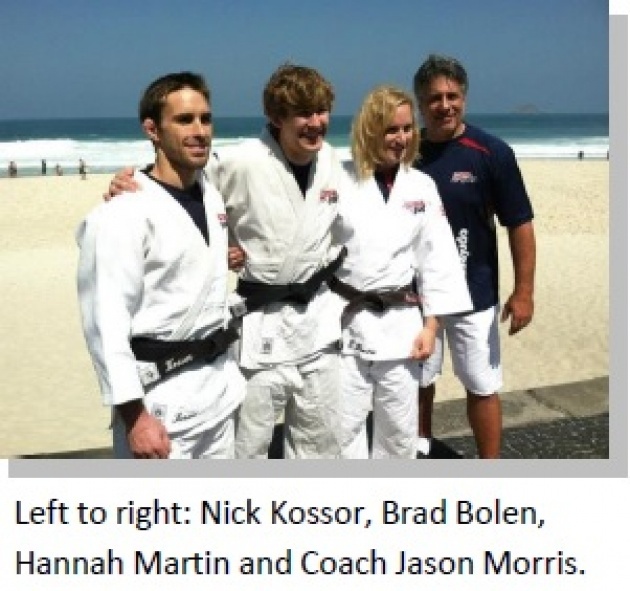 Kayla's appointment rounds out what has been a benchmark year for USA Judo. Late last week, USA Judo CEO, Jose Humberto Rodriguez was named to the IJF Executive Commission. This is the first time a representative from the United States has served on the Executive Commission.